West End actor Ramin Karimloo will star as Jean Valjean in Cameron Mackintosh's London production of Les Miserables at the Queen's Theatre from 29 November 2011 to 3 March 2012. He will take over from Alfie Boe, who is currently playing the role until 26 November 2011. West End actor Ramin Karimloo will star as Jean Valjean in Cameron Mackintosh’s London production of Les Miserables at the Queen’s Theatre from 29 November 2011 to 3 March 2012. He will take over from Alfie Boe, who is currently playing the role until 26 November 2011. Ramin will join a cast that includes Hadley Fraser as Javert, Caroline Sheen as Fantine, Alexia Khadime as Eponine, Craig Mather as Marius, Cameron Blakely as Thénardier, Katy Secombe as Madame Thénardier, Liam Tamne as Enjolras and Lisa-Anne Wood as Cosette. 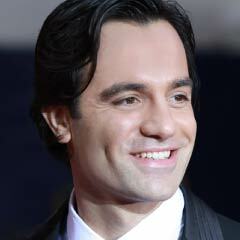 Ramin Karimloo is best known for playing Andrew Lloyd-Webber’s ‘The Phantom’ in both The Phantom of the Opera at Her Majesty’s Theatre and its sequel, Love Never Dies, which ran at the Adelphi. He also featured in the recent 25th Anniversary celebrations for Phantom at the Royal Albert Hall. Ramin is no stranger to Les Mis having played Enjolras in the West End – and at the show’s 25th aniversary concert at the O2 last year. His other credits include Miss Saigon. Mackintosh is currently working on the movie version of Les Miserables with Working Title films, with Hugh Jackman as Jean Valjean, Russell Crowe as Javert, Anne Hathaway as Fantine, Helena Bonham Carter as Madame Thenardier and Geoffrey Rush rumoured to be playing Monsieur Thenardier. The movie will be directed by Tom Hooper (The King’s Speech) and written by William Nicholson. I was privileged to see Michael Crawford & Sarah Brightman in the opnnieg weeks of Phantom. I was just a teenager, but I was so moved by it that I didn’t want to see another musical for years after, for fear that it would spoil my memory of Phantom (I had already seen Cats, Starlight Express & Michael in Barnum).This Christmas I asked for the 25th Anniversary DVD of Phantom & I was not disappointed: what a fantastic performance! What’s more my 4 year old son is completely entranced by Phantom & wants to watch it over & over! Bravo!So disappointed that LND ended its run before I had chance to see it. Who will be the cast for the closing performance of les mis in London, march 28th 2012?